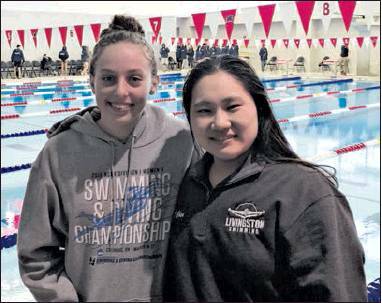 The Livingston High School swim team competed in the Super Essex Conference (SEC) Championships, held at the New Jersey Institute of Technology on Monday, January 21. The boys’team finished in fourth place, with the girls finishing in eighth place. Two Lady Lancers, Isabella Chen and Alessia DiBlasi, won first place medals in their events. For the boys, Brandon Kim finished in third place in both the 50 meter freestyle and the 100 meter freestyle, and he was a part of the 200 meter medley relay and the 400 meter freestyle relay, which also finished in third place. Dylan Belluardo, who was also a part of those relays, finished in third place in the 100 meter butterfly. Also contributing in the relays were Aaron Teng; Ben Ma in the medley; and Andrew Li and Ken Lok in the 400 meter freestyle relay.